Yesterday, was the longest day of the year here in the UK, I say UK as it was still the day before or even tomorrow in some parts of the world! So seeing how we’re now living in Wiltshire, it seemed logical to try and witness the Summer Solstice sunrise at either Stonehenge or Avebury. Stonehenge didn’t seem like the best option, as we felt it would be crowded and a nightmare to get there and park, especially in the dark, so we picked Avebury. 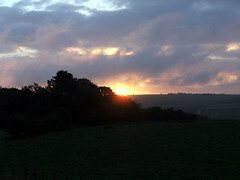 So at around 11 pm on Tuesday, we headed up over Knapp Hill, down past West Kennett and up the Stone Avenue to Avebury. 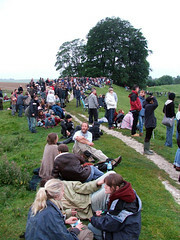 The usual parking was out-of-bounds, so we had to park in a National Trust field with all the other solstice punters. Police and parking wardens wearing bright yellow, reflective vests were everywhere and what little excitement we had drifted away with the wind and light drizzle that was in the air. 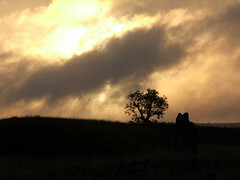 Over in the main circle, by the largest standing stones, were what can only be described as a drunk, possible even stoned (no pun intended) gathering of people dancing and jumping around to the beat of drums. The drums were cool, so we hung around for a while, but nothing very exciting happened, and because there was a ban on all open fires, there was nothing to sit around and keep warm while having a chat. Then around 2 am, the drizzle turned to rain, so we decided to head back to the car for a nap. Sometime around 4 am the rain stopped and the clouds had started to clear. It was possible to see the odd star here and there, and the moon was clearly visible to the east as it had only risen around 1.40. So we decided to head back to the circle and wait for the sun. Standing on the southern bank overlooking the standing stones to the north and the Avenue to the south, we stood chatting and hoping the clouds would clear sufficiently enough to see the first rays of sunlight race across the Wiltshire countryside. At 4.50, the sky started to turn red and there was an energy of anticipation in the air. All in all, my first Solstice morning was a mixture of excitement and damp disappointment, but well worth staying up all night for. But if we were to do it again, and I’m sure we will, we will stay at home and set the alarm for 4 am (ish) and make our way there just to see the sun-rise. As a combination of silly rules and regulations concerning safety, drunk, wannabe new-agers and of course the rain, kind of spoilt what at one time must have been a very magical experience. Are you ready for a Weird Weekend?